Mysterious departures clutching a black briefcase full of regalia were a regular occurrence in my childhood. Most of the adult males in my family were Freemasons. One of my earliest memories is being shown the Temple at my Grandfathers Masonic Lodge. The Masons are not a secret organisation; rather “an organisation with secrets” was the mantra. The Masonic Hall might have been a regular meeting place for the men but women were welcomed in just twice a year for Ladies Evening and the New Year Party. 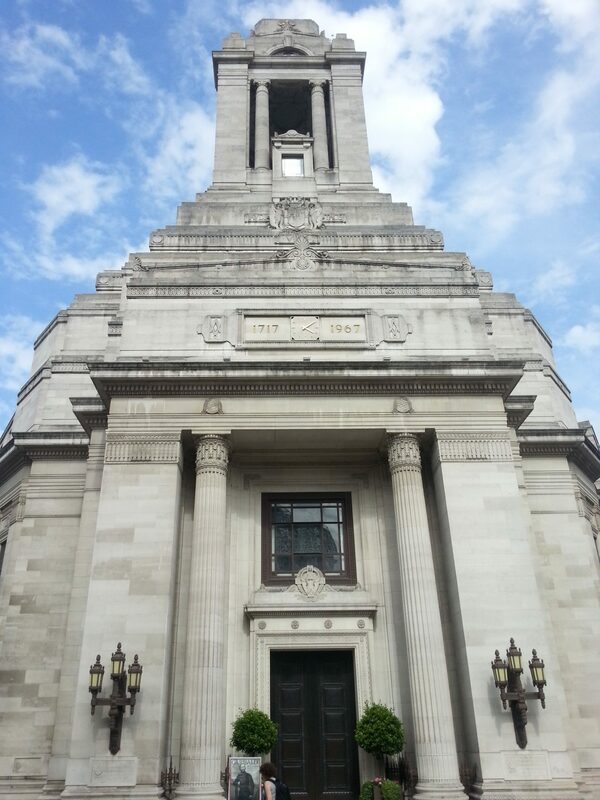 So when I learnt that anyone can visit the Freemasons’ Hall in Covent Garden I was off in a flash. Given the fraternal nature of the Masons, I half expected a raised eyebrow at the arrival of a lone woman at the Freemasons’ Hall. I was, however, greeted with a broad smile and sent up the stairs to the Library to join a tour of the building. Having been told the basics of the craft, we headed for Grand Officers Robing Room which is dominated by enormous blue baize covered tables. The Grand Officers of the Lodge process into the room to find their regalia laid out for them. As they clamber into their aprons and collars and pin on their chest jewels, they are overlooked by the portraits of current and former Grand Masters; George IV, Edward VII, George VI and the present Duke of Kent. George IV declared that reigning monarchs could not be Grand Masters and so all relinquished their title on becoming King. Once resplendent in their regalia the Grand Officers process to the Grand Temple. Outside the Robing Room the first hints of the celebrated Art Deco interior become apparent in a long corridor. Masonic symbolism is everywhere. The floor has a blue star mosaic that echoes in the design of the light above. Masonic symbols here, just the dark blue, light blue and gold that are the colours of the basic craft order. Once out of the corridor you enter three enormous interconnecting rooms, all are adorned with Art Deco mosaics and stained glass. These are not just stunning, beautiful rooms they are a War Memorial to the 3,225 Freemasons who died in the First World War. The first vestibule houses a bronze arc that contains the Roll of Honour, the walls of the room are engraved with names of the Lodges whose members subscribed more than a million pounds to construct the memorial. All those mysterious masonic rituals take place in Masonic Temples. As headquarters of the United Grand Lodge of England the Freemasons’ Hall has many temple but most magnificent of them all is the Grand Temple. The doors to the Grand Temple are vast. They are made of cast bronze and each weighs one and a quarter tonnes. At the time of their making were the largest in Europe. Monumental the doors maybe but so accurately engineered that you can open them with just one finger. If the previous rooms have been jaw dropping the Temple itself is awe inspiring. Even empty it is jawdropping, it must be an impressive sight when filled with 2,000 men clad in leather aprons. 123 feet long, 90 feet wide and 62 feet high, the room is huge. Masonic symbols abound, seven stars representing the seven liberal arts adorn the ceiling, with one and half million tiny tiles making up the mosaic that covers the coving. At the centre of the temple is a chequer board carpet on which the masonic rituals unfold. In the beginning Masons really were masons building the great Cathedrals of the Middle Ages, like most trades the masons had a guild to ensure the quality of the craft. Quite how a trade guild morphed into gentlemen’s club in the 18th century is unclear. What is known is that the symbols that I most associate with the Masons, the square, compass and trowel are the basic tools of a mason. Just like their medieval guild predecessors, modern Masons progress from being an Apprentice to Journeyman before becoming a Master Mason. Every Freemason must profess a belief in a Supreme Being, in practice this means that the craft is open to people of all religions. There is a strict ruling that religion and politics must not be discussed at meetings. Strangely when we children asked the grown men what they did at Masonic meetings this is what they told us. Not what they did but what they didn’t do. I still don’t have the slightest idea of what actually happens inside those temples, but even just to see such magnificent architecture it is worth visiting Freemasons’ Hall. Freemason’s Hall is part of Museum Mile, a collection of 13 museums of varying size all within walking distance of each other including the Charles Dickens Museum and Sir John Soane’s Museum. It always makes me laugh when you see hoards of besuited, briefcase toting men heading into the Freemasons Arms opposite! I suspect that if we all knew it would turn out to be pretty dull! Wow, love those stained glass windows! I felt a bit naughty during the whole tour, as they had been forbidden fruit for so long!